On this Fiber Friday eve I'd like to share a taste of things to come. It's been a great week for spinning, for the most part. The keen observer will note there are eight skeins here which is my weekly goal... this also means I spun on the rest day. The truth is that the cyclists spin on the rest days too so they don't get too stiff. No rest for the weary I suppose. I've got two woolly singles, one 2-ply, two plied with thread, (one with beads) and three pure silk. 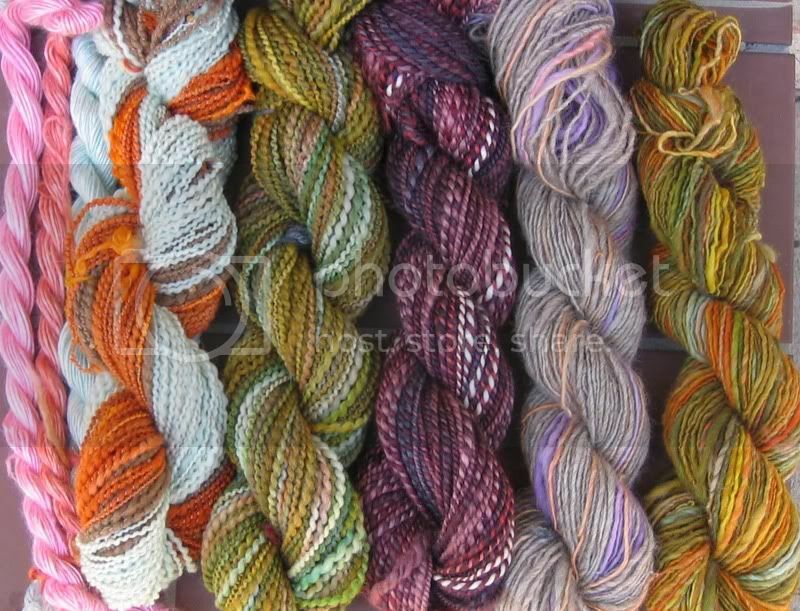 Tomorrow I will have full pictures of these skeins as well as their stats or stories. Except the silk. I'm waiting until I have all the mini-skeins of silk before taking their picture. They're too tiny! i missed yesterday! when's the next rest day, so i can make it up, lol?